AUTHOR INFORMATION: Jim Bernheimer lives in Virginia with his wife and two daughters. He has previously worked in the IT field since the past decade. He was inspired to start writing after reading the works of Robert Heinlein, Edgar Allen Poe, J.R.R Tolkien, and C.T. Westcott. He has previously written quite a few short stories which can be found here. By day he works as a Network Admin and runs his own computer consulting firm. About Dead Eye: Pennies for the Ferryman: My name is Mike Ross. I'm a Ferryman. I help people with ghost problems, or ghosts with people problems. Funny thing, no one ever helps me with my problems. Civil War ghosts bent on killing me, Skinwalkers who just want my body, and a vindictive spirit linked both to my bloodline and my destiny. The dead still hold a good deal of influence over the world, and they don't want to give it up. About Dead Eye: The Skinwalker Conspiracies: My name is Mike Ross and I’m a Ferryman – like in the Greek myth. I didn’t ask for, or really want, the job, but I’m trying to make the best of it. Most ghosts are okay and just need a little help to get where they need to go. Unfortunately, there are lots of exceptions, like power-mad psychopaths, spirits still trying to fight battles long since lost, and the worst of the lot – the Skinwalkers. They live vicariously by possessing people and controlling them like puppet masters. Then they toss them aside when they’ve outlived their usefulness. One of them stole some one close to me fifteen years ago, and now I’m going to make that ghost pay. CLASSIFICATION: The Dead Eye series is a multi volume urban fantasy series which combines the mystery plot aspect showcased in books by John Connolly & Harlan Coben with the dark humor laced prose of Jim Butcher & Tim Marquitz. FORMAT/INFO: Dead Eye: Pennies for the Ferryman is 258 pages long divided over thirteen numbered and titled chapters. Narration is in the first person solely via Mike Ross. 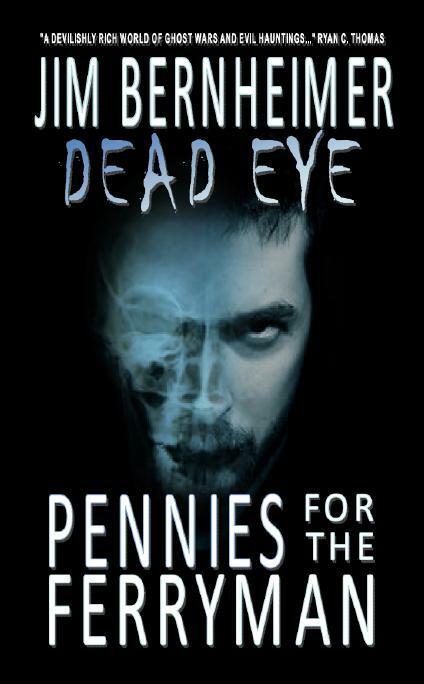 Dead Eye: Pennies for the Ferryman is the first novel of the Dead Eye Chronicles. 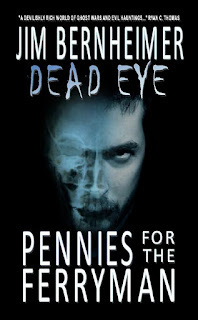 May 18, 2009 marked the Paperback and e-book publication of Dead Eye: Pennies for the Ferryman via Gryphonwood Press. Cover art is done by Shannon Farrell. FORMAT/INFO: Dead Eye: The Skinwalker Conspiracies is 248 pages long divided over sixteen numbered and titled chapters (The numbering however is continued from the first book and so the first chapter is numbered fourteen and so the last chapter is twenty-nine). Narration is in the first person solely again via Mike Ross. Dead Eye: The Skinwalker Conspiracies is the second novel in the Dead Eye Chronicles. September 18, 2011 marked the Paperback and e-book publication of Dead Eye: The Skinwalker Conspiracies via Gryphonwood Press. Cover art is done by Shannon Farrell. ANALYSIS: The Dead Eye series is a urban fantasy series that had its first book released nearly three years and as usual with my past record of discovering books later than usual, I happened upon it last year when the sequel was released. For this review I’ll be jointly reviewing both the books as they run in continuation as the chapter numbering indicates. The blurb details pretty much cover of what the story is about in both cases. However I didn’t know what to expect exactly, of course I had an assumption about it and in a way it was wrong as assumptions usually go. The first book begins in a laconic fashion with the narrator Mike Ross explaining how he life took its first turn for him after he joined the army and went to Iraq. Things however don’t work out for him abroad as he’s injured in an attack which leaves him visually handicapped and soon is sent back home wherein he receives a new transplant for his damaged right eye. He plans to begin college and so enrolls in a local college called Montgomery College. That is wherein he meets Jenny Goodman, a girl whose interests align a bit with his own, things however soon start taking a weird turn when Mike starts seeing ghosts with his new eye and then finds out his role-to-be as a Ferryman. Ghosts soon start popping up alarmingly around him and he gets embroiled in matters of a supernatural origin involving civil war era ghosts and the origin of Mike’s Ferryman Status. The second book starts off quite close to the end of the first one and deals with the revelations which occur in it. Mike has some pretty heavy stuff revealed to him in regards to his powers and his ancestry. These revelations put him on a road to dealing with the people who are called Skinwalkers especially since one of them has interfered with his family in the past leading to the current situation in the Ross household. From here the story escalates wildly as the author tries to enmesh the multiple plotlines introduced in the first book along with those rising in the sequel and make the world settings deeper than they are visible. To further discuss any more of the plot would lead to spoilers about its predecessor and so I'm going to refrain from doing such. The story begins on a very personal front and takes it time to coalesce, until then the reader is given a nice dry overview of life, social standings and other things by the world-weary narrator and even though he’s only twenty-three years old, it doesn’t come off as impetuous or whiny. What also helps the tone of the book is that the narrator Mike Ross who is an everyman hero and who unlike Peter Parker doesn’t even have any superpowers to bank upon. What he does have in spades, is an iron willed determination and a sarcastic sense of humor which keeps the reader chuckling along. The story unlike most urban fantasy stories begins slowly and doesn’t really herald a world completely aligned with the fantastic. The world showcased is very similar to our one in its mundaneness and inanity. However once Mike starts experiencing his new ability is when the story really progresses into the supernatural zone. This plot progression is smoothly enmeshed within the story and I enjoyed how the author showed that while things are heating up on the paranormal front, the normal human part of Mike’s existence isn't left in a limbo. We find out how his normal life is progressing or rather hampered by the other side. The ghosts described in this world are as vindictive, moody and as vicious as the humans inhabiting the world alongside them. Mike then discovers certain irregularities involved with his eye transplant and it’s from this turn that the book involves Civil war era history, ghosts, the writing of Edgar Allen Poe and much more. The prose is very accessible and makes for an easy read. The paranormal settings are revealed quite steadily and this helps the reader as nothing is out of the left field except for the twists of the plot. Overall the best parts of the story are its narrative voice, easy prose and difference in the story approach from the usual urban fantasy trappings. The negatives to this story could be that readers who are so used to finding vampires, Lycans and other supernatural folk frequently in their stories might find their absence a bit disorienting, as they are accustomed to. This is however less of a concern in the second book wherein the supernatural aspects are increased exponentially. Another concerning feature is that sometime the sub-plots take a life of their own and threaten to overwhelm the main plot but the author manages to keep them in check in both the books. It’s never made certain whether this is done intentionally to show the chaos in Mike’s life or was something which developed during the writing process. CONCLUSION: Jim Bernheimer is an author who has done things differently with his urban fantasy books and this just proves that even in an almost saturated sub-genre, one can still use their imagination to craft a story which delights and thrills readers who are fast getting bored of reading all-too-familiar stories every year. For all urban fantasy and mystery readers, these books are definitely worthy of your time & money, as for me I can’t wait to see where the author takes our beleaguered protagonist next and what new travails await the young Ferryman. Thanks for the excellent in depth review! I'm intrigued! Glad to hear that you enjoyed it.